The thyroid, a small, butterfly-shaped gland below your Adam’s apple, pretty much rules your body, says Douglas Husbands, DC, CCN, a clinical nutritionist and chiropractor in San Carlos, California. It regulates your metabolism, explains Husbands, and an underactive thyroid (hypothyroidism) slows everything down – from your pulse and temperature to your energy level and the rate at which you burn calories. An overactive thyroid (hyperthyroidism), on the other hand, revs the body into overdrive. Hypothyroidism – the more common condition by far – usually crops up in women, people older than 60, and those with a family history of thyroid problems. Worldwide, the most common cause is iodine deficiency, but in the US and other developed countries where people use iodized salt, the principal culprits include autoimmune disorders (in which immune cells attack the thyroid tissue), radiation to treat cancers of the head and neck, and medications such as lithium. The laundry list of potential symptoms includes fatigue, forgetfulness, depression, heavier periods, dry hair and skin, mood swings, weight gain, intolerance to cold, hoarseness, and constipation. 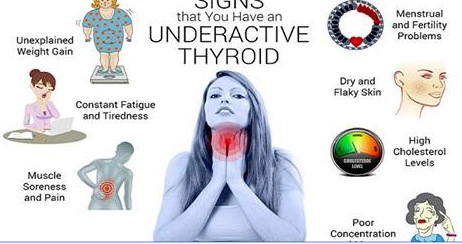 If you have a number of these symptoms, you should think about having your thyroid hormone (thyroxine or T4) and thyroid-stimulating hormone (TSH) levels tested. Depending on the results, you may need to take daily synthetic thyroid hormones. But you can also complement hormone therapy with the following key nutrients, all of which are necessary for healthy thyroid function. Even if you have normal thyroid levels, these essential vitamins and minerals can help keep your thyroid running smoothly. Before thyroid hormones can do their job, your body must convert them into an active form. This requires the mineral selenium. Husbands recommends that people with thyroid problems—as well as those with healthy glands—supplement with 200 mcg of selenium (he prefers selenium methionine) daily to promote thyroid health. You can get the same amount from one big handful of Brazil nuts, which are by far, the best food source of the mineral. You also need an adequate amount of zinc for your thyroid hormones to function correctly, notes Shomon. In a small clinical study last year, researchers at the University of Massachusetts found that the thyroid hormone levels in zinc-deficient women improved significantly after four months of treatment with a 26.4 mg daily dose of zinc. Although further research is needed, Shomon suggests taking 10 mg of zinc a day; and because zinc can block copper absorption, be sure to take 1 to 2 mg of copper daily as well. Too little L-tyrosine, a critical amino acid, limits the amount of thyroid hormones the body can make, so taking L-tyrosine supplements can kick start a sluggish thyroid, Shomon says. She notes, however, that “L-tyrosine supplements can be too stimulating for some people,” giving them the “jitters” and causing insomnia. Start with 200 mg or less a day and work up to 500 mg if you tolerate it well. Essential for many bodily functions, iodine also plays a role in the production of thyroid hormones. “But it’s tricky,” says Shomon, “because while iodine deficiency is a major risk factor for hypothyroidism, too much iodine can aggravate the thyroid and worsen existing conditions.” You need at least 150 mcg of iodine a day, most of which you can get through salt. That amount should be a cinch—the average American consumes four times this much. However, if you use noniodized salt, you need to get iodine from other sources, such as seafood, seaweed, dairy, and eggs. If you eat any of these foods, you shouldn’t need to supplement. Problems from too much iodine arise when you take several milligrams daily.